My name is Gwen Frost, and I go to Mythos Academy—a school of myths, magic and warrior whiz kids, where even the lowliest geek knows how to chop off somebody's head with a sword and Logan Quinn, the hottest Spartan guy in school, also happens to be the deadliest. But lately, things have been weird, even for Mythos. First, mean girl Jasmine Ashton was murdered in the Library of Antiquities. Then, someone stole the Bowl of Tears, a magical artifact that can be used to bring about the second Chaos War. You know, death, destruction and lots of other bad, bad things. Freaky stuff like this goes on all the time at Mythos, but I'm determined to find out who killed Jasmine and why—especially since I should have been the one who died. . . The story about me obtaining this book was all on a whim. (Read blog post here). But I soon ended up reading it and liking it a lot. This book wasn't something extraordinary but the main character Gwen was really relate-able and Jennifer Estep's characterization allowed us to feel like we've known Gwen forever. I thought that the plot was really intricate and well thought out and wasn't just your ordinary average Joe 'boarding-school for paranormal beings' book. The students are warriors sent to the academy to train for an upcoming battle between the Greek gods and goddesses. This book was also really enlightening about Greek Mythology and was really fun to read. I found myself thinking that Logan Quinn (The hunky dangerous guy) was irresistible no matter how cliche the encounters between him and Gwenn were. I'd recommend this book, I gave it a four out of five stars on GoodReads and it definitely is a spring/summer type of book. 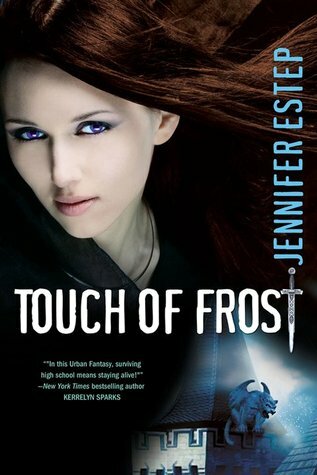 I'll soon be reading the sequel in the Mythos Academy series called Kiss of Frost and I'm kind of excited to find out what's going to happen after the cliffhanger we were given at the end of Touch of Frost. I'm also thinking about possibly making a giveaway for this series once I finish reading the whole thing...still not sure but we'll see how things go :). It's really good you should totally check it out :) It's got a couple of adult scenes though haha. I had originally picked up the book for my younger sister and after reading it I decided I probably won't let her read it until later on.